It took me some time to join the ranks of caped crusader. I was ambivalent about it, being that I never really grasped the whole cape/poncho concept. Moreover, I was at a total loss as to how to rock a cape and thinking back now it was the thought of looking like a grown-up in a swaddle blanket. Actually back in 2007, I made a Knit Capelet and once it was completed, I was like oh boy here goes the swaddle blanket feeling again. Honestly, the knitted capelet was all about the knitting and cabling being that it was my first or second year learning how to knit. That capelet was given to my niece who loved it. 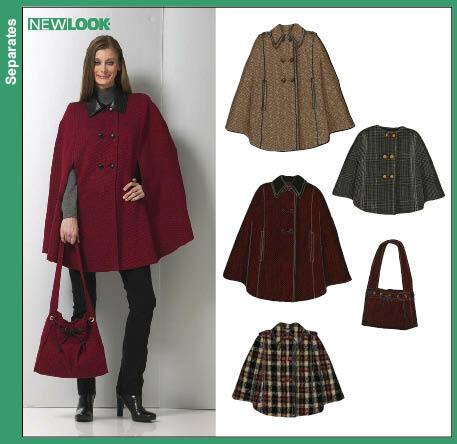 Now fast forward to 2014 and for the last 2 years, capes have made a big presence. I think what finally turned me into a caped crusader is seeing how the style/fashion magazines have featured them as fashionable accessories. Showing how to and what to wear with them. In comes New Look 6756: double-breasted cape featuring shoulder epaulets, with or without a collar, arm openings and buttons. Over the last few years I have acquired a lil collection of home dec fabrics that I'd purchased from Fulton Fabrics. Selected a psuedo-boucle fabric in a deep apricot and cream from my stash. 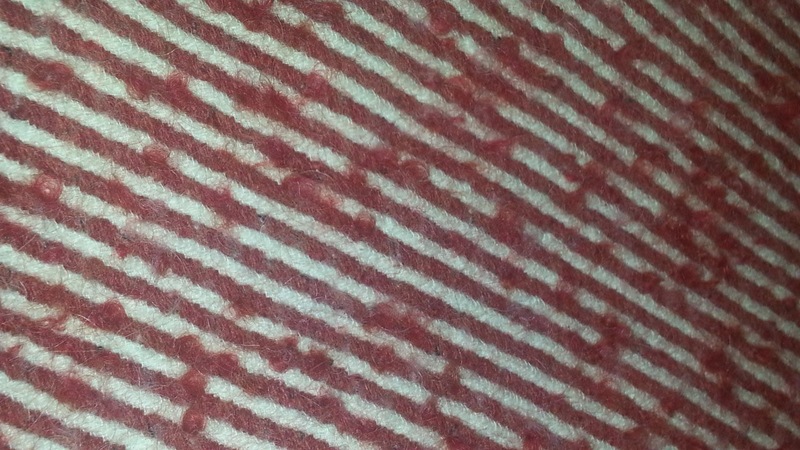 This fabric turned into a soft dream after it was washed. First and foremost this garment is a fabric hog. For a medium it calls for 3-1/2 yds. From my perspective, there is really no way to gauge fit, but in eyeballing the front side & back side pattern pieces, it was clear that they were akin to the wings of a 747. From that, I removed an 1" from the front side & back side pattern pieces. Construction for the most part was easy, and after serging the panels together, the tedious part occurred when I decided to topstitch the seams and then construct the lining. Please note, make sure to check the arm opening length. I found that it was not long enough and increased it. 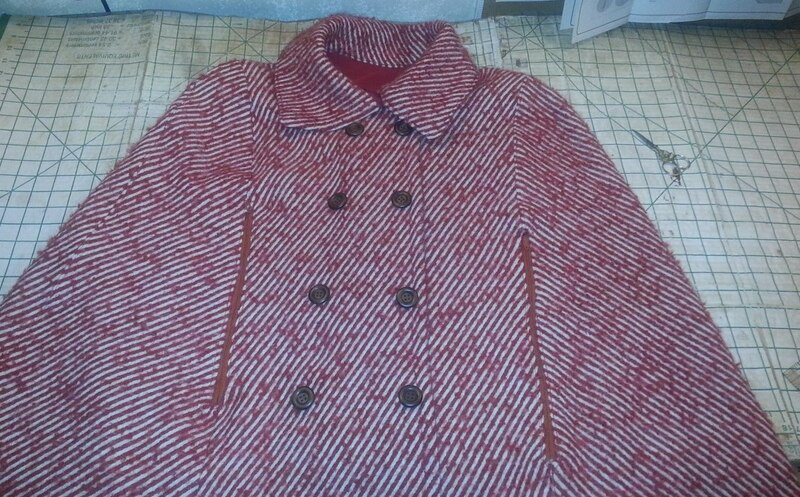 I used a red stretch woven for the lining and ended up not having enough for the front panels (and no way to get more, the fabric was purchased in Atlanta 2 years ago) and had to use another fabric which was a knit and as close in color as I was going to get. incorporated that detail in my cape and was lucky enough to have zippers that closely matched the fabric. also black toggles, but only had two. 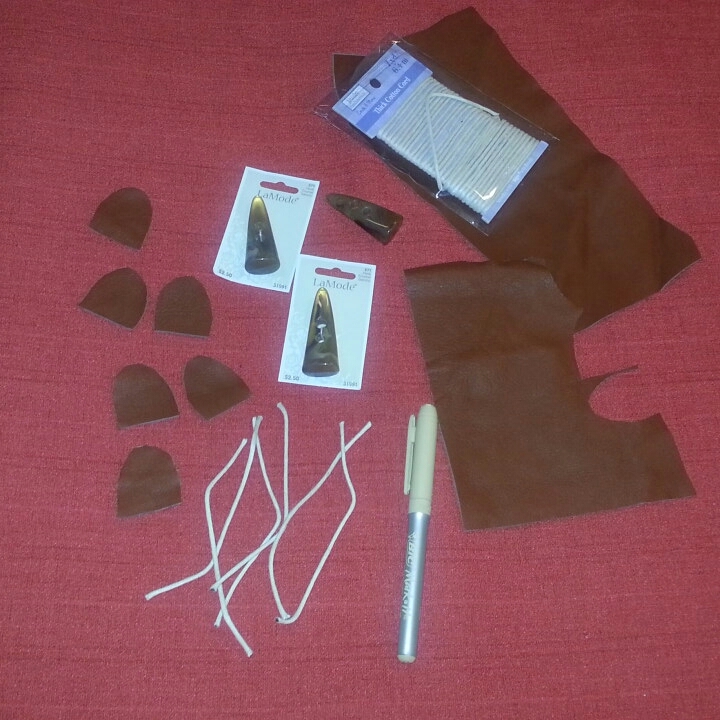 So I decided to make my own and made a pit stop at Sav-a-thon and luckily they were selling real leather scrap pieces and purchased them, as well as cotton cording. The toggles were purchased at JoAnns, and they were just what I was looking for. Used the existing black toggles as a template to cut the patches and length of cording and used a permanent sharpie in Tan to color the cording. At the neckline of the cape I have fabric covered snaps. Finally, feeling all trendy without looking like I am wearing a swaddle blanket. Love the zipper detail at the arm opening. Feeling like a true caped crusader. I love your new cape especially the toggles and the zipper closings! It is very pretty! Work it girl. That's the best styled cape I've ever seen. Now you've got me wanting one! Wow, what a great look you created! Your attention to detail makes this look like a designer garment, which of course it is! Very pretty, love the zipper details. AMAZING cape! AMAZING work!! Great job!! Thank you Rachell. Definitely do it, a perfect fashionable accessory to add to your wardrobe. Thank you Lucy. I am glad I added the zipper deail, although it was a little fiddly working with the lining & fashion fabric. With that, there are some sewing scars on the underside of the zippers. Love your new cape Sheila. Very chic! Uhm...this is FAB!!! I love that you added the toggles, looks much better than the buttons IMO. AND...I'm impressed that you made them yourself - very nice touch! This has got to be one of my faves so far! Nice work! Werk!!! I love your cape, great fabric choice. I still wear the one I made almost 5 years ago. I must have a super hero complex lol. Hi Tanya and thank you. Love it. I want to make a cape so bad but I don't have need for one here in FL. I may make one just to have anyway. I love yours. instrument to measure wind speed can be of two types. Cabled and portable. Rain gauges,wind meters,radios with NOAA alert and data loggers are also used for measuring weather.